On this private tour you will explore an area of outstanding natural beauty with a multitude of different landscapes, which we will admire from a Celtic hill-top vantage point. The area is known as the lower Rias Baixas and Baixo Miño, it is the coastline that follows down from Vigo to A Guarda -the last village of the Galician coast before reaching Northern Portugal- Then the river Miño flows into the Atlantic Ocean separating Galicia from Portugal. Starting the day we will make a stop at the bordering town of Tui, which posses a well preserved historic quarter and a Fortified Cathedral also visited by many Pilgrims on their way to Santiago coming from Portugal. On the other side of the river is Portugal's fortress town of Valença do Minho. We will enjoy the spectacular views from the top of a Celtic Hill-fort while having a seafood lunch with different types of shellfish and the fruits of the sea, and of course accompanied by the local Rosal wine. This area, apart from the scenery, offers fabulous wines, which are grown in the O Rosal valley a sub-zone of the D.O. Rias Baixas. Here they make Albariño wine as well as the local Rosal wines which are a blend of different local grape varieties including Abariño. We will take detailed tour of two of the most important wineries of the area and try the difference between types of wines produced. Before ending our day we follow up the rocky coastline to Baiona a resort town with an important historical past since the first word of the discovery of the Americas came into the bay on La Pinta en 1493. A day packed full of contrast and different flavors! After this we head deeper into the wine country to visit a second winery Lagar de Cervera. Lunch is in a restaurant in the port where we will enjoy the amazing seafood... Lobster, clams, scallops etc... with Albariño wines of course! 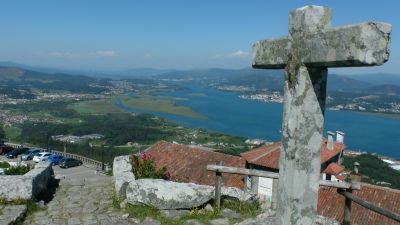 Then after lunch we go up to the top of the hill Monte de Santa Tegra with remains of a Celtic Hillfort, a small museum and amazing vantage point with panoramic views of the river Miño meeting the Atlantic sea, and views of the mountains of Northern Portugal. We continue along the rugged Rias Baixas coastline until reaching Baiona a resort town with an important historical past since the first word of the discovery of the Americas came into the bay on La Pinta. We stop to get more views from the Monterreal Castle which is now a Parador hotel offering views of the Cies Islands. Transportation in Mercedes Benz Viano Minivan or Minibus depending on group size. 2 VIP private vineyard and winery tour including tasting of 3 wines.